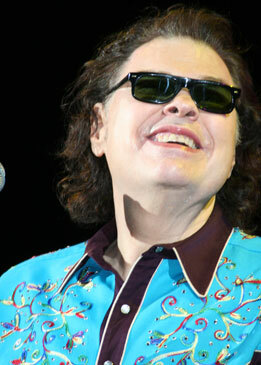 Call A to Z Entertainment, Inc. today for free information about how to hire or book country musician Ronnie Milsap. With over twenty years of successful experience, we are your best agent and talent agency for booking and hiring country music singer Ronnie Milsap! If you like, we also help you plan and produce your show or event, so call us today at 888-655-4575 and we’ll be happy to help you. Some evenings, Ronnie Milsap goes to the WSM-AM 650 radio studio and sits with legendary country music air personality Eddie Stubbs. The visits aren’t about promotion, they’re about inspiration, and Milsap listens intently as Stubbs plays classic country music CDs, vinyl albums and even thick, supposedly archaic 78 RPM records. 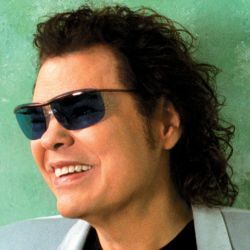 Since his troubled childhood days in Appalachia, Ronnie Milsap has been drawn to the simple and plaintive sounds of country. His voice is well capable of singing blues, R&B, pop and rock sounds, and his 40 chart-topping hits cover a wider stylistic terrain than any other superstar of country music. And Ronnie has often described himself, happily, as a crossover artist. But in the new century, his visits with Stubbs at WSM and at the Grand Ole Opry tweaked an interest in once again singing more elemental country songs. With Country Again, through a partnership between Milsap Music and Bigger Picture, he has done just that. 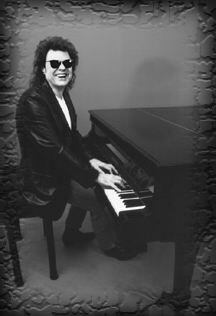 It’s Ronnie’s first country- oriented album in six years, and cuts such as “Cry Cry Darling” and “Almost Mine” are his most traditional country excursions since 1973’s “I Hate You,” “That Girl Who Waits On Tables” and “(All Together Now) Let’s Fall Apart,” the three songs Ronnie Milsap recorded at his very first Nashville recording session. Twelve country songs later, Stubbs is an executive producer. Ronnie Milsap and his co-producer, Rob Galbraith, rounded up a crew of master musicians including fiddler Andy Leftwich, steel guitarist Paul Franklin and harmony vocalist Dawn Sears (of Grammy nominated group The Time Jumpers) and recorded an album that is a showcase for Milsap’s rangy, emotional voice, an instrument that has helped him to four Country Music Association male vocalist of the year prizes and to six Grammy Awards. Born in the mountain town of Robbinsville, NC, Ronnie Milsap was raised by his bluegrass-loving father and by his grandparents in the unincorporated Meadow Branch community in western North Carolina. Each weekend, the struggling family gathered around a battery powered radio and tuned in to the Grand Ole Opry on WSM, listening to Roy Acuff, Ernest Tubb, and other country music greats. Ronnie attended a school for the blind in Raleigh, enduring abusive treatment from some staff members but emerging with enhanced musical knowledge and a love of rock, pop and other non-Appalachian forms of music. Indeed, he can. And he has, famously and satisfyingly and profitably, for much of the past forty years. And now he’s Country Again. With one of modern music’s most remarkable careers already under his belt, Ronnie Milsap could relax, stay out of the studio, stay off the road and wait for someone to fashion the inevitable bronze plaque that will one day hang with his heroes in the Country Music Hall of Fame. Instead, he’s driven to wake each day and do what others would call work but what he considers sustenance. We can help you book or hire any country musicians, country music singers, and live country music bands in addition to those you see here on our site. Having helped hundreds of clients, we are your best agent and agency for booking and hiring Ronnie Milsap, so call us at 888-655-4575 today. We are not the exclusive agency for any live corporate entertainers on this site.